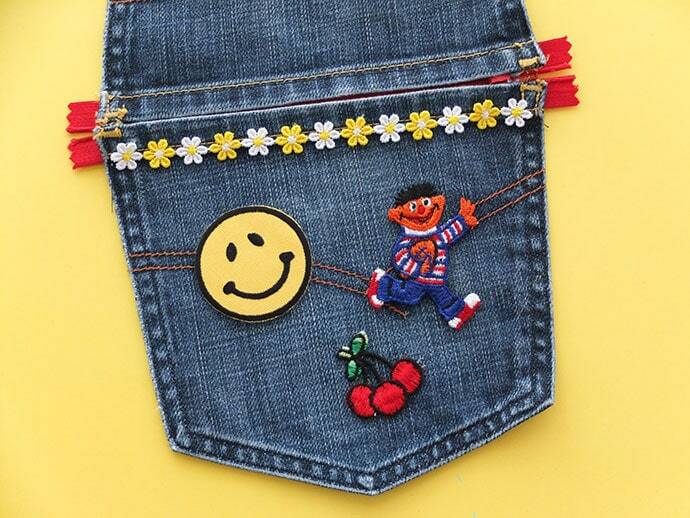 Years ago, my mum told me about how in the 70’s she used to make purses out of the pockets of worn out jeans, it’s a fabulous upcycling idea that is really easy to do. My husband wears through his jeans all the time, and even though I patch and repair them where I can, eventually they need to be retired. Rather than throw them away I cut up and save the good pieces of denim for other sewing projects. 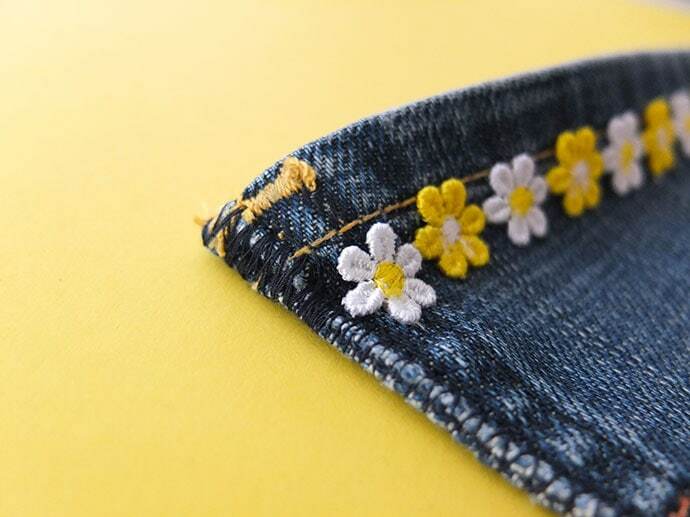 I’ve been saving the pockets for a while now and recently I found a whole bag of them while tidying up my sewing room, I remembered my mum’s retro craft idea and thought it would be fun to give it a try. 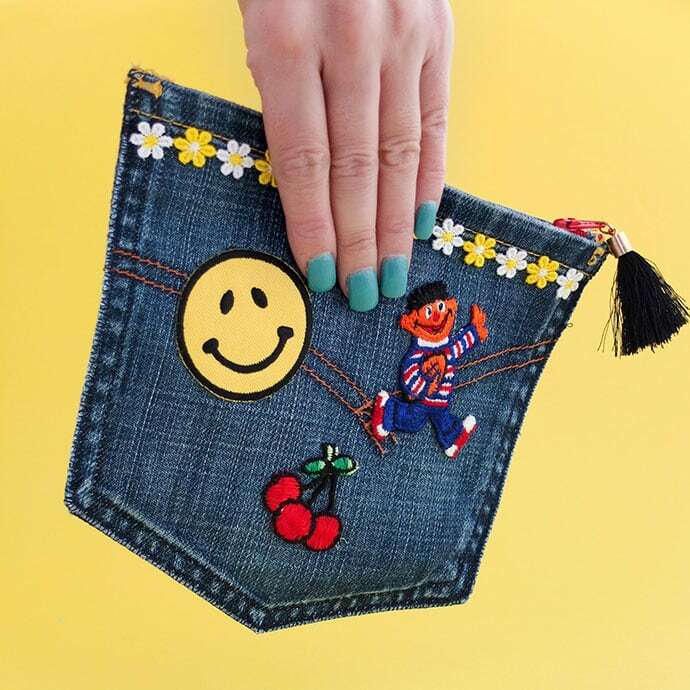 When I think of 70’s denim, my mind goes to flares embellished with floral trims and embroidered patches, so I thought I’d capture that same spirit in my little pocket pouch. I have a small collection of thrifted vintage patches and trims that were perfect for this project. My favourite is Ernie playing footy wearing his Western Bulldogs jumper (well that’s who Emma thinks he barracks* for). Don’t have a pocket handy? 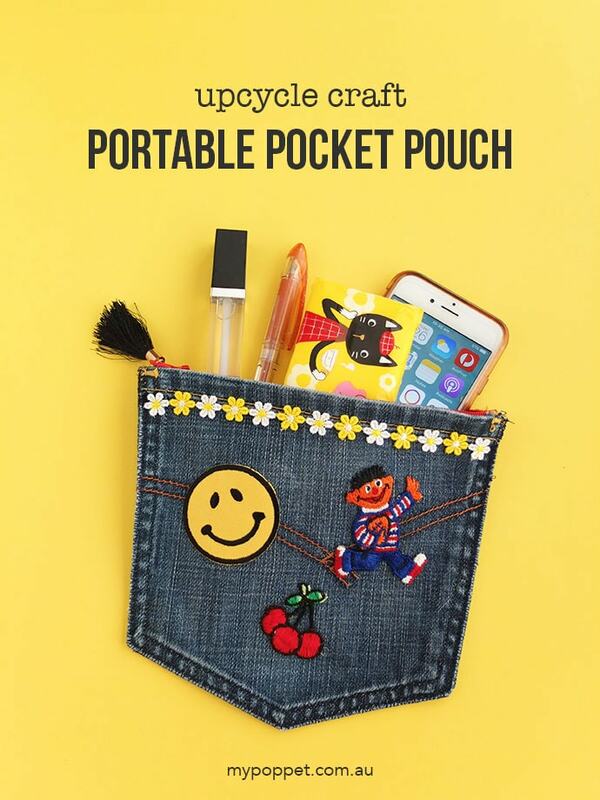 No problem, now you can make a portable pocket pouch to carry all your essentials wherever you go. 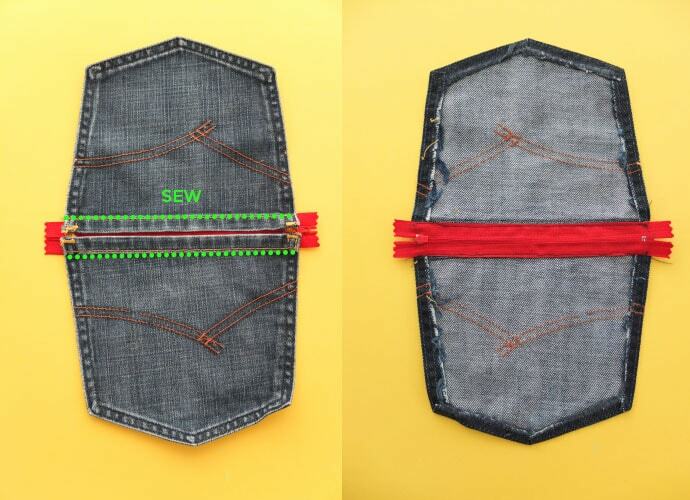 You can whip one up in a few minutes using the pockets of your old jeans. 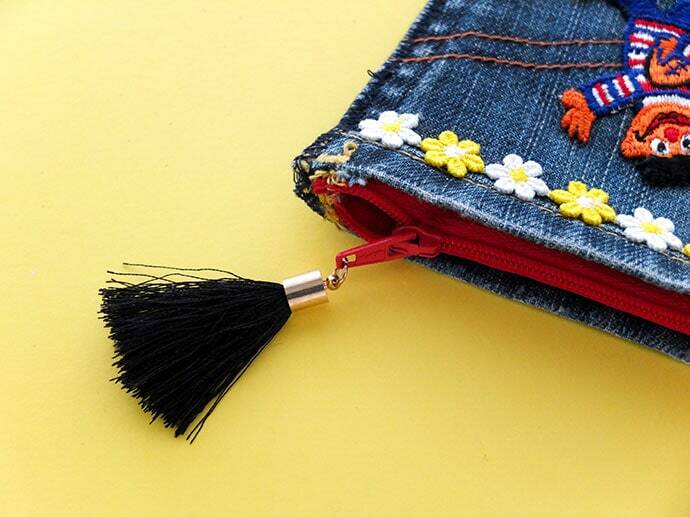 If you want to make your pocket pouch extra fancy like mine, add some decorations and a tassel to the zipper pull. 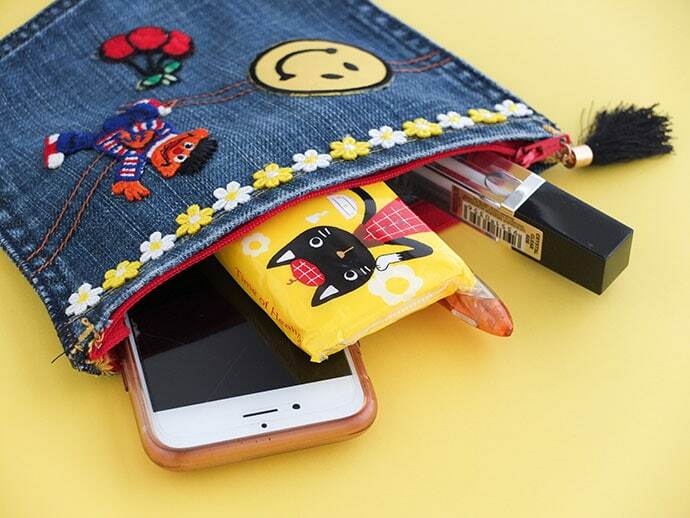 The bigger your pockets the bigger your finished pouch will be, so try using pockets from kid’s jeans to make small coin purses, and pockets from men’s jeans to make a pouch that will hold your phone and make-up. 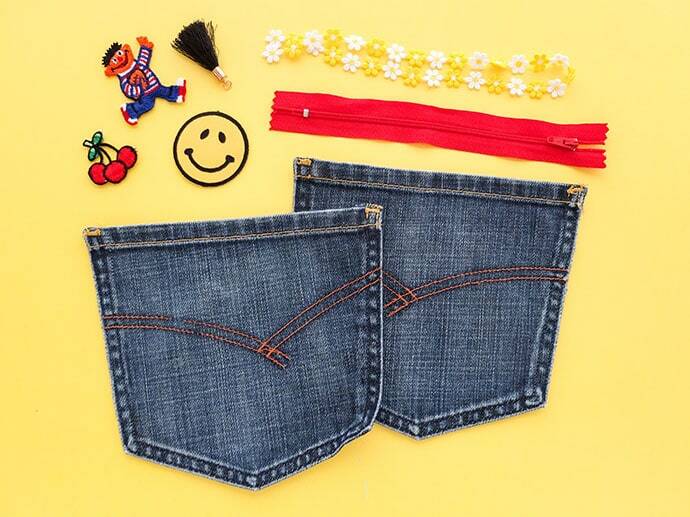 1/ If you haven’t done so already, go ahead and unpick the seams that attach the pockets onto the jeans as carefully as possible to remove the pockets. You may need to clip some of the stronger top stitch threads. 2/ Lay out both pockets facing up and line up the top edges. Pin the zip (also facing up) in between the two pockets. Sew as indicated by dotted green line. On the right I’ve shown the reverse view. 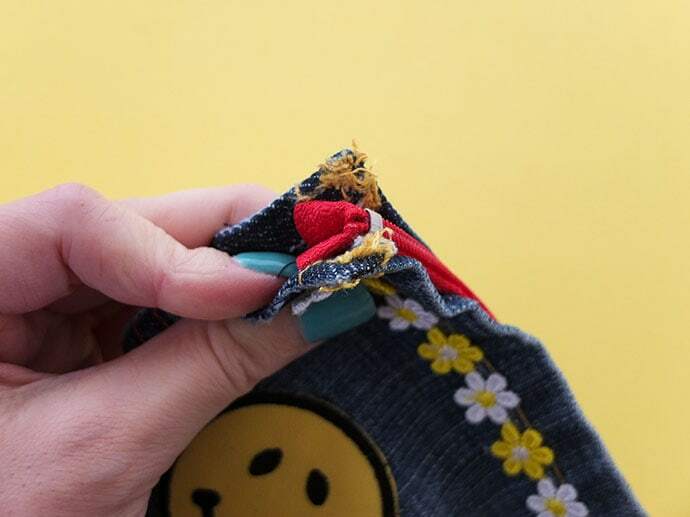 Tip: depending you your zip and presser foot width, it may help to open it and sew part of the way, then finish sewing the seam with the zip closed. 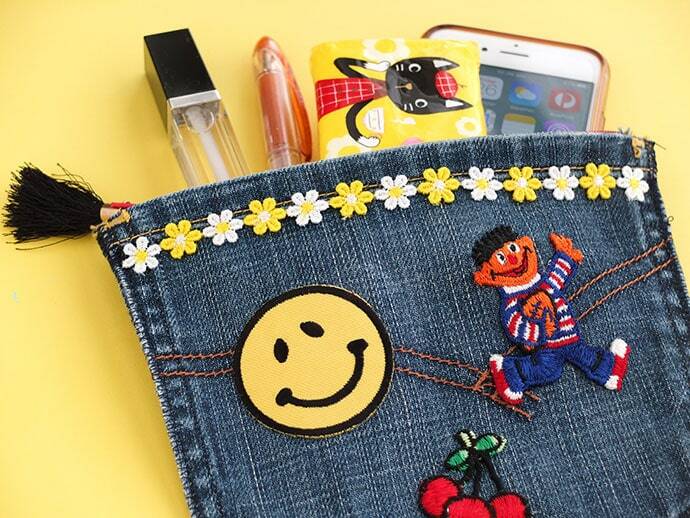 3/ If you are going to embellish your pocket pouch, now’s the time to do it. I’ve used a glue stick to partly secure the trim and patches. 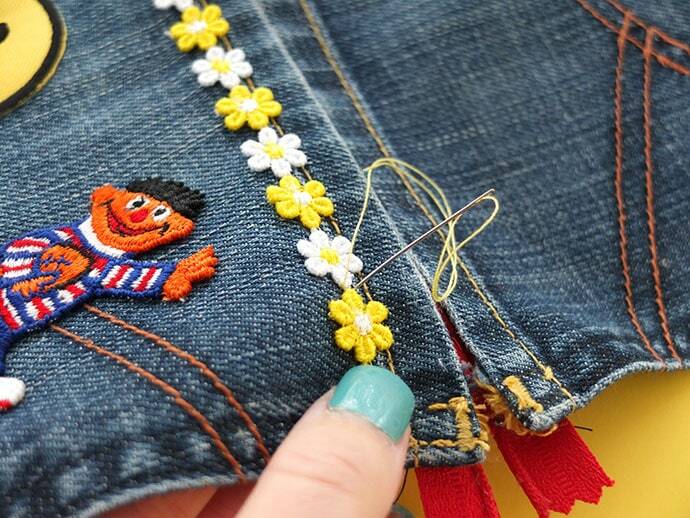 4/ To ensure trim and patches will stay on after repeated use, tack down the embellishments with some hand stitches. 5/ Fold both pockets down so they are edges are aligned and tuck in ends of zip on both sides so they are shorter than the outside of the pockets. Pin to secure if required. 6/ Sew with a narrow zig zag stitch around the outside of the pocket edges being sure to catch both font and back pocket edges. 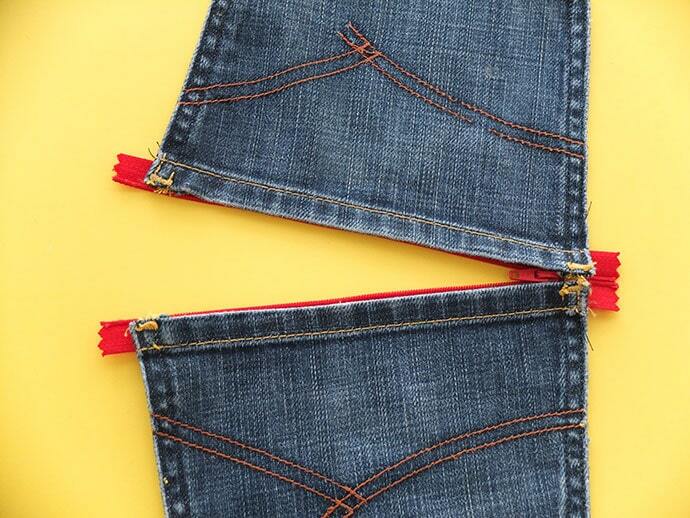 7/ Add some extra zig zag stitches to the top of each side seam to reinforce the opening near the zip. The purse is now ready to use. 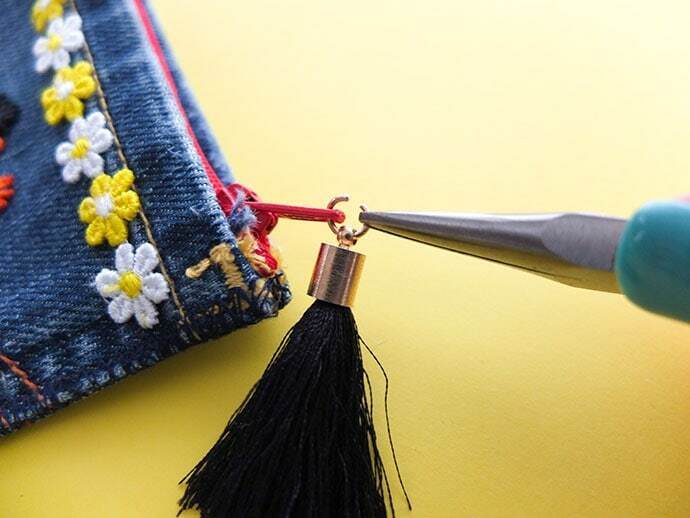 8/ To add the tassel, open the jump ring with jewellery pliers and slip the ring through the zipper pull. Close jump ring to secure. If you want to make your own tassel follow these instructions but replace yarn with embroidery floss – How to make a Yarn Tassel. The tassel makes it easier to open and close the zip, so it not only serves a decorative purpose, but a practical one too. 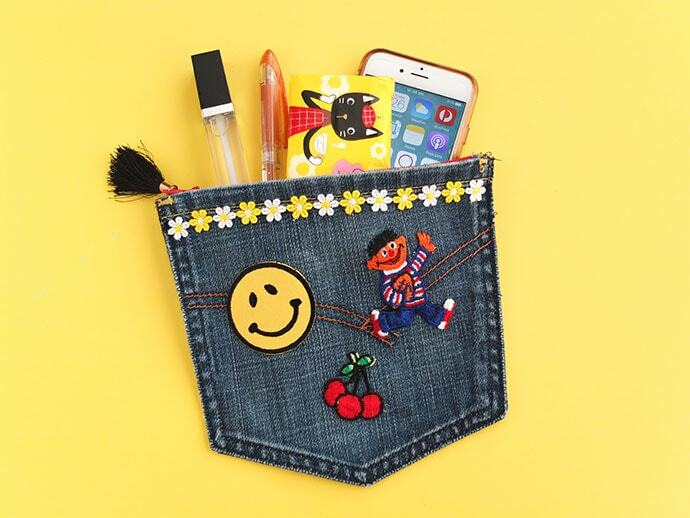 Now you are ready to fill your portable pocket pouch with all your essentials. Throw it into any bag and you’re set for the day. 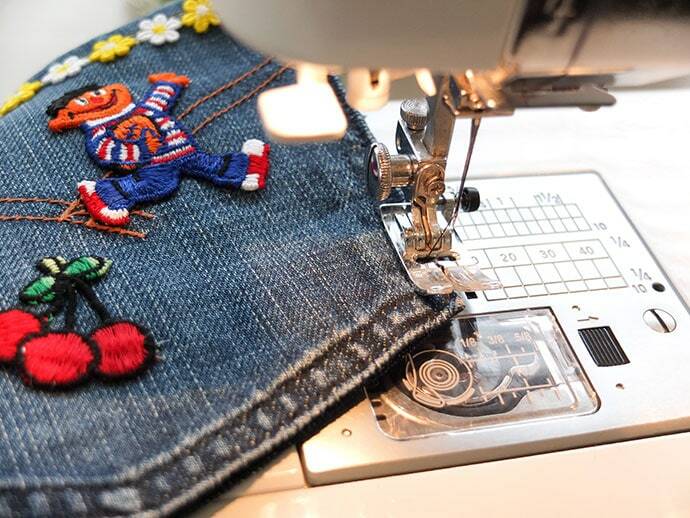 What to do do with your old jeans? Found this on Pinterest. Excellent tutorial. I’ll be using jeans sewing needles (90 or 100) for this so I don’t break needles on the thick fabric. Love that you are Aussie and, also that you took the time to make up this instructional, as I like to post complete instructional pins for my friends who are new to sewing and this is the only one I could find out of around 10 I viewed. Thank you so much :D.